Title: Who Was That Masked Man? Disclaimer: Mulder, Scully, Pendrell, and Skinner are not my characters. They were used without permission. Many thanks go to Suzanne Bickerstaffe, for proofing, posting, and polishing out the rough spots. Summary: All are not who they appear to be at the Annual Masquerade Ball. Scully groaned when she saw the envelope on her desk. She knew without looking what it would be - her invitation to the Annual Halloween Masquerade. It was a social event held every year by the FBI, one of the supposedly "just for fun" gatherings with the unwritten rules that at least one person from every department *had* to make an appearance. For the last three years, since she'd joined Mulder in the X-Files, it had fallen to her to be their representative. Mulder hated Bureau social events of any kind, and would only go if under direct orders. "Hmm?" He didn't even look up from the file he was reading. "Why don't you go to the Masquerade this year?" "And listen to "Spooky" jokes all night? I don't think so." "It's your turn," she pointed out. "I've gone for the last three years." Mulder finally turned his head to look at her over the tops of his glasses. "I thought you liked these things, Scully. You never said anything before." I'm just tired of suffering by myself, she thought. Aloud, she sighed and said, "I don't exactly like them. They get boring." Mulder stared at her for so long she began to wonder if she'd spoken her thoughts aloud. "I doubt I could even find a costume at this late date, but I promise I'll go next year. Okay?" "Sounds good to me." Hey, it was more than she'd expected. Scully's phone rang and Mulder overheard her increasingly irritated conversation with the costume shop where she'd rented a costume. There had been a mix-up, and the costume she'd been promised had accidentally been given to someone else. The only costume remaining in her size was a fairy costume. Mulder had to bite his lip to stifle a smile at the thought of his so-serious partner dressed as a winged creature of lore. She was about the same size as Tinkerbell! After she'd hung up the phone hard enough to make him wince, she grumbled to herself for a few minutes, muttering something about preferring to go as an ax murderer. Not long after, she stood, collecting her things. "I'm going to go pick up my costume before those idiots lose it, too. Then I'm going home. I'll see you tomorrow." Mulder watched thoughtfully as Scully stalked out the door. There was definitely a reason she didn't want to go tonight, why wouldn't she just tell him what it was? He sighed. Maybe he should go after all, just to make sure she was okay. The thought of enduring hours of jokes at his expense make him cringe, but he would do it for her. Suddenly he remembered someone who owed him a favor - - someone who could arrange for him to get through the evening *unseen*. He thought about the box that had resided under his bed for nearly a dozen years, then dialed a number from memory with the beginnings of a smile on his face. Nearly four hours later Mulder opened the door of his apartment, going directly to the bathroom to look in the mirror again. He couldn't believe the job Monica had done. He'd left the office as soon as she'd agreed over the phone and had gone directly to her studio. Now, even HE didn't recognize the face that looked back at him from the mirror. He grinned at his reflection experimentally, watching the latex crinkle just like skin. Monica had even given him the faintest hint of blonde stubble. She was good. No wonder she made big bucks now. It was getting late, he needed to hurry.... In his bedroom he knelt and pulled the dusty box out from under the bed. He hadn't worn the costume since Oxford, but he hadn't changed too much. Hopefully it would still fit. It did. A fair-haired Prince of Darkness now stood in the middle of the room fastening the buckle that held the cape to his shoulders. Ick. He felt ridiculous. He was glad Monica's makeup magic was hiding his face. Only fair, since it was Monica's fault he'd had to buy this damn costume in the first place, as she'd gotten him into the fight that had damaged it. He'd had it repaired with the idea of re-selling it, but somehow had never gotten around to it. It could have been worse, he decided after checking in the mirror once more. It could have been a Prince Charming costume. He felt naked leaving the apartment without his gun, cell-phone, or wallet. The only thing in his pockets was money. His key was tucked into one of his shoes. As he ran down the outside steps to the street he pulled on supple black leather gloves. Scully knew every scar he had, especially the one on his hand she'd sewn up herself. He didn't want to let such a small detail give him away. Luck was with him and he found a cab right away. Giving the driver the address, he leaned back, checked to make sure he had his invitation - so conveniently generic - and took a deep, steadying breath. Scully looked at the clock on the ballroom wall for what seemed like the thousandth time, willing it to move faster so she could make her excuses and go home. She'd seen Skinner once already, and had nearly been cornered by a tipsy Pendrell. Unfortunately, he wasn't the only male agent giving her undue attention tonight. It was this stupid costume's fault. The damn thing made her look like a toy. Promising herself she'd make sure the owner of the costume shop got a written complaint about the mix-up, she made a mental note to find another shop before next year. Left to himself, Mulder would forget about a costume until the last minute, and she planned to make sure he had no excuse to back out of his promise. She'd reserve a costume for him herself, plenty of time in advance. The blonde vampire turned and caught Scully watching him. Bowing slightly to her, he sketched some sort of salute, then turned and walked on. Scully realized she'd been holding her breath, and let it out slowly. The small black eyemask he wore covered very little of his face and did nothing to hide his blue eyes. She was sure she'd never seen him before. But there was something so familiar about him...! Mulder made his way to the windows, barely managing to avoid running into Skinner on the way. Of course, as long as he didn't speak there was little about him to recognize, but he didn't want to risk it. He'd nearly swallowed his tongue when he'd seen Scully staring at him as soon as he walked in the door. From the puzzled look on her face he was fairly certain she hadn't identified him. He hoped he'd be able to keep an eye on her from a distance until she left, and he'd never have to get too close. God, she was gorgeous in that costume! In the suits she normally wore her figure was mostly hidden. Her fairy costume, however, was basically a flesh-colored body stocking with a few strategic 'petals' and 'leaves' of yellow and green satin sewn on. A short skirt of loose petals and leaves skimmed the tops of her suprisingly long legs. Large gossamer wings seemed to grow from between her shoulder blades. She'd done something wild to her hair, too. It was as tousled as he'd ever seen it, and glitter sparkled among the fiery curls. Some of the front was gelled into spiky bangs, falling across the top of her opaque green half- mask. Her eyes, carefully made up, looked huge, and her lips were the color of strawberries. Men were circling her like vultures. Scully was giving a couple of them icy glares. Mulder hadn't seen them do anything particularly obnoxious yet, and wondered what had his partner so riled. Then, taking another look, he realized they were dressed alike in black suits, white shirts, and extremely loud ties. "Spooky" Mulder costumes? He frowned for a moment, then grinned. He supposed he could consider the imitation as flattery, as the saying went. Apparently Scully didn't think they were funny, though. She pointedly turned her back on them and walked away. For the next fifteen minutes Mulder followed the short red-headed fairy through the crowded ballroom, always staying at a discrete distance. Several times a tray of drinks was offered by a passing waiter, but he always shook his head. Alcohol would dissolve the glue on his teeth, and he was pretty sure that by now even the punchbowl had been spiked. A few women approached him. Two of them were easy to get rid of, a third was seemingly intrigued by a silent man. When finally forced into it, he spoke in a raspy whisper and told her he was coming down with something and had lost his voice. That did the trick; she beat a hasty retreat. Pendrell managed to sneak up and snag Scully from behind, and Mulder tensed. She was obviously not thrilled to see the man in the pirate costume, but she kept a smile pinned on her face as she disentangled herself and pointed him at some other unsuspecting woman. Agent Tasker found her next, and Mulder watched them circle the dance floor to a big band tune. The small winged woman looked out of place in George Washington's arms, but at least he seemed to behave himself. When he left her at the edge of the floor at the end of the song, though, Mulder was close enough to see the trapped look in her eyes when she realized Pendrell was approaching from one side and a Krychek-look-alike from the other. Unable to bear seeing his partner and friend in distress, Mulder gave up with an inner sigh and moved forward. Just remember not to speak out loud! he reminded himself firmly. Stepping deliberately in front of her, he bowed and held out a black-gloved hand. "I offer my protection," he whispered, the sound raspy in his suddenly dry throat..
Scully stared up at him, her head tilted slightly, for so long that Mulder had to force himself to stand still. He'd nearly given up and dropped his hand when she finally moved. Extending her hand slowly, she finally slipped it into his. Watching her fingers curl around his Mulder noticed even her fingernails were glittery. Smiling, he drew her toward the dance floor. Scully had seen the blonde vampire watching her several times since he'd arrived. He always seemed to be nearby when she looked around, hooded eyes turned her way. There was something so familiar about him! Then, coming off the dance floor with Agent Tasker, she'd found herself trapped between two persistent admirers with no quick escape route. Then suddenly the Prince of Darkness was before her, his gold hair gleaming in the soft light of the chandeliers. He spoke in a raspy whisper that sent tremors down her spine, and for a long minute she could only stare. Feeling oddly as if she could trust him, she finally put her hand in his. The smile he gave her as he led her to the dance floor revealed a slightly crooked bottom front tooth - and very real-looking elongated canines. Fangs. He was tall, right around six feet, and moved with an easy grace. He danced well, and the hands holding her were gentle if somehow possessive. Large, strong hands, warm even through the leather encasing them. Another couple staggered slightly, knocking into Scully and crushing her up against the white silk of his shirtfront. When she didn't pull away, his arms shifted to hold her there. The song was slow, another lengthy big-band number. The Vampire Man didn't make any attempt at small talk, and Scully found herself relaxing, leaning against him and letting him guide her where he would. For the first time during the long evening, she began to enjoy herself. She scarcely noticed when one number ended and another began, gradually, losing all track of time. Her mysterious Vampire was silent for the most part, his voice never rising above a whisper the few times he did speak. He looked after her solicitously, seldom leaving her side. Skinner sidled up to her one of the few times he did. "Agent Scully, who is the man you're dancing with?" the AD asked. "It isn't Mulder, is it?" "I don't think Mulder would be caught dead in a vampire costume," Scully answered with a slight grin. "Actually, sir, I have no idea who he is, but he's not Mulder. The Vampire Man has blue eyes." "He hasn't told you his name?" "He told me to call him Vlad, but I somehow doubt that's his real name, don't you?" "Um-hmm," Skinner agreed, frowning. "I'm glad you seem to be enjoying the evening, Scully, but - just watch yourself, okay? Something about that guy is so familiar...." Spotting the blonde-headed man nearing them, Skinner gave Scully a last nod and disappeared back into the crowd. It almost as if scarcely any time had passed when the band started to play a fanfare and the lights blinked, signaling the approach of midnight. 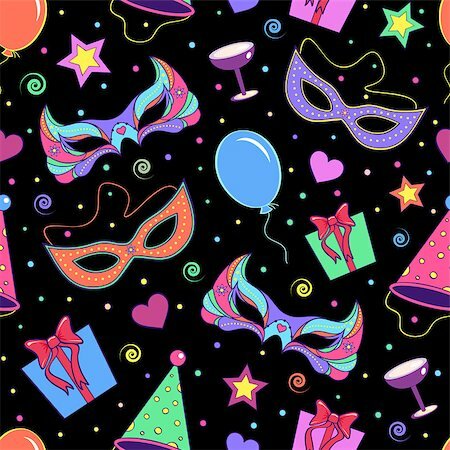 Although some people had already removed theirs, midnight was the traditional time for unmasking. Scully was surprised to find 'her' vampire leading her out of the ballroom and onto the low balcony, into the seclusion of the shadows. The Vampire turned to face her, bringing her hand to his lips. "I have enjoyed your company this evening, but, regretfully, now I must leave," he whispered. Gathering her close in his arms, he bent to kiss her tenderly. His lips still brushed hers as he whispered his farewell. "Good night, beautiful one." Dazed, it was a moment before Scully could get her eyes to open. When she did, it was just in time to see her mysterious Dark Prince vault lightly over the balcony rail into the darkness below. She raced to the edge and looked over, but saw nothing. He was gone. Mulder hit the ground with his knees bent, barely managing not to lose his balance. Staying in the deepest shadows he streaked around the building to the front where taxis were lining up for fares. Throwing himself into the first one, he told the startled driver to go. Nearly three blocks later he finally managed to give the man his address. Pulling the blonde wig off suddenly gave the driver a start, but when he started peeling his face away the poor man nearly had a heart attack, jerking the wheel enough that it got Mulder's attention. Realizing what the driver had just seen, Mulder laughed and tried to reassure him. "Just part of the costume. You know, from the Masquerade...." He smiled, and was suprised when the man just stared. Catching his reflection in the dividing glass, he finally realized the man could see the fangs... Thankfully, it was a short ride to his apartment building. Mulder added a healthy tip as he paid the fare, and wondered what sort of stories the driver would tell tomorrow. Retrieving his key from his shoe, he made his way quickly up to his apartment and inside. He went straight to the bedroom without even turning on a light, already pulling off his costume. Folding it haphazardly, he stuffed it back into the box along with the wig and pushed it under the bed. He'd peeled most of the latex mask off already, but what was left was beginning to really itch. And the contacts were bothering him. He headed for the bathroom and the shower. He'd just flopped on the sofa and turned on the TV when his cellular rang. He picked it up on the second buzz and answered, "Yeah, Mulder." Oh, man, he was hoarse! Must be from straining to whisper over the music and background noise at the ball. "Mulder? What's wrong with you, you sound terrible." "Scully?" What the hell was she calling him for? Think fast, Mulder! "I was watching TV. I guess I fell asleep." "Are you okay, Scully? I thought you were going to that Masquerade tonight." "I did, Mulder." She was sounding exasperated, something he took as a positive sign. "It's after one a.m. I just got home." "Oh," he said. His voice was starting to get back to normal again. "So, how was it? As bad as you thought it would be?" "Not really. It had its ups and downs, but mostly I enjoyed myself. There was a guy there that looked a lot like Krychek, Mulder. He gave me the creeps. Oh, and Skinner asked about you again this year." "Did anyone give you a hard time? 'Cause if anyone did, we can get Frohike to screw up their credit rating or flag them for an IRS audit." Scully laughed, making Mulder smile. "No," she said, "no one bothered me much this year, thank goodness. Well, I guess I'd better get to bed. I'll probably be late coming in tomorrow." "S' no problem, Scully. Sleep in a little. If anything important comes up I'll call you." Flopping back on the sofa, Mulder let his breath out in relief. So maybe Scully had suspected something after all.... He'd have to watch his step for a while. If she ever found out it *was* him she'd probably shoot him again. Sleep took him by surprise, catching him with a faint smile still on his face.